Hey yall, I'm up on the SRM Stickers blog today. 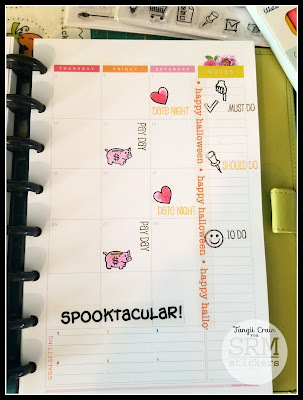 For today's post I did some playing with some Halloween stickers and Planner stamps (all items used are listed at the bottom of my post). 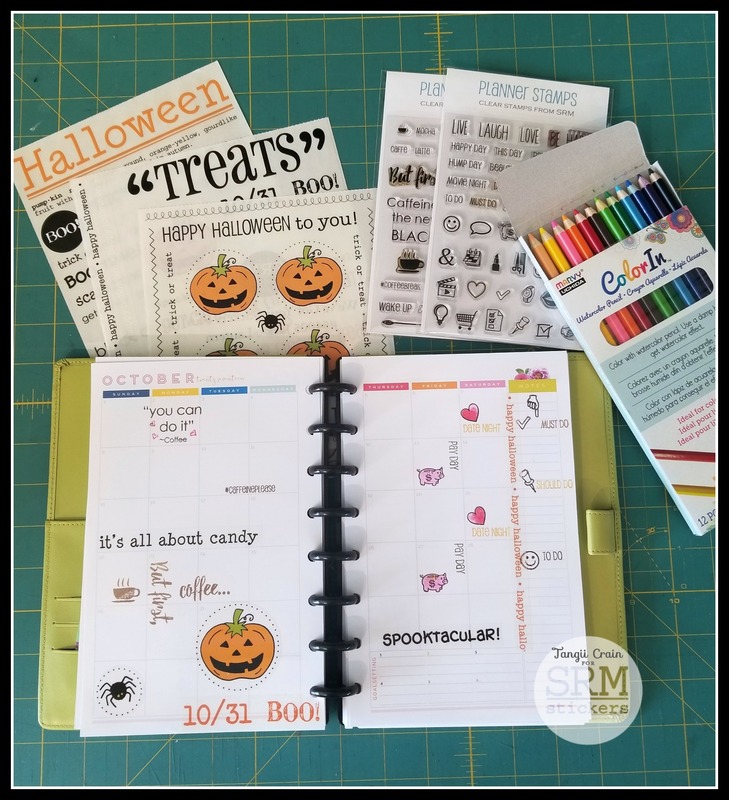 This is my Daughter's planner and is actually a 1/2 sheet size, so 5 1/2" x 8". I also used the Coloring Book Watercolor Pencils (12 pack). My daughter struggles when Monday strolls around, and being the coffee lover that she is, I used the Coffee Plans, Clear Planner set on Mondays. I also had some fun with the 31st, she still LOVES dressing up for Halloween, lol. 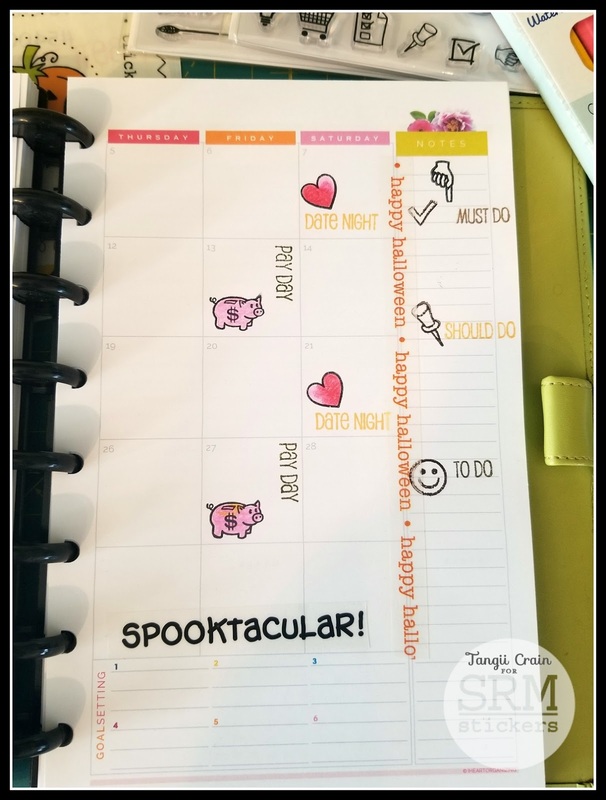 Her planner also has weekly layouts, but when I decorate my Monthly views I always make sure there is still room for writing things in! Thanks for stopping by! Hello, I'm up on the SRM blog today with a name plaque I made for Huck's toybox, ahem, one of his toyboxes, lol. Today I'm playing with some Matte Vinyl. I have a super cute Blonde Lab that is spoiled as all get out!! 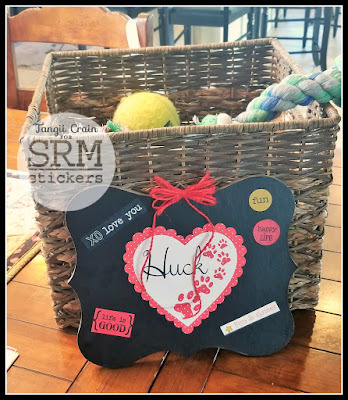 This is one of his Toy Baskets and I've decided to make him a name plaque for it! I also added a few stickers from my stash (We've Got Your Stickers - Sweet, Sentiment - Life Is Good, Express Yourself - Birthday) For the ones that wouldn't show up on that black, I simply adhered them to some cardstock, cut them out and then adhered them to the plaque. I apologize for not taking pictures along the way, honestly I was having so much fun with this and was so excited... I forgot, lol. Ok so there are 3 layers here, the first being that pretty scalloped heart in Red Polka Dot Vinyl. The 2nd is the heart in White Vinyl and on this one those paw prints are actually cut out so the Red Polka Dots show through (LOVE THIS!). 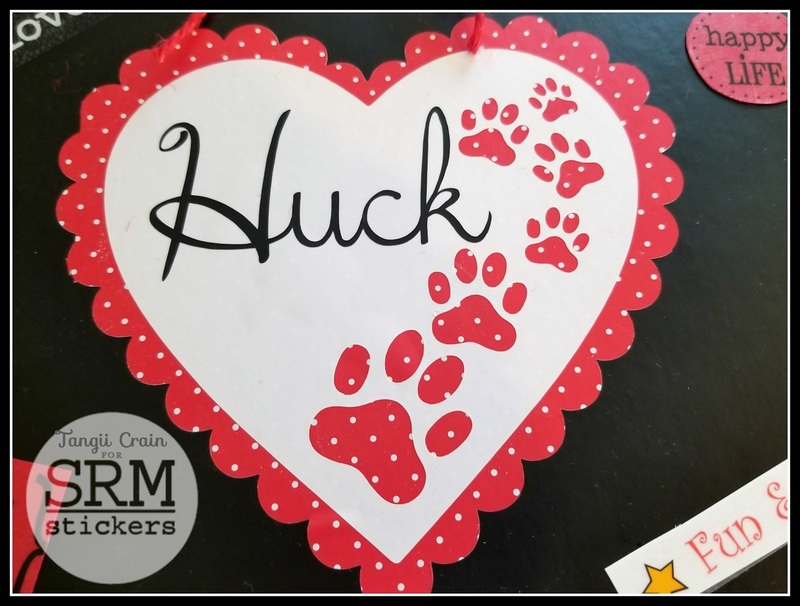 The 3rd layer is Huck's name, in Black Vinyl. This is by far my favorite Vinyl of all of the brands I've used! 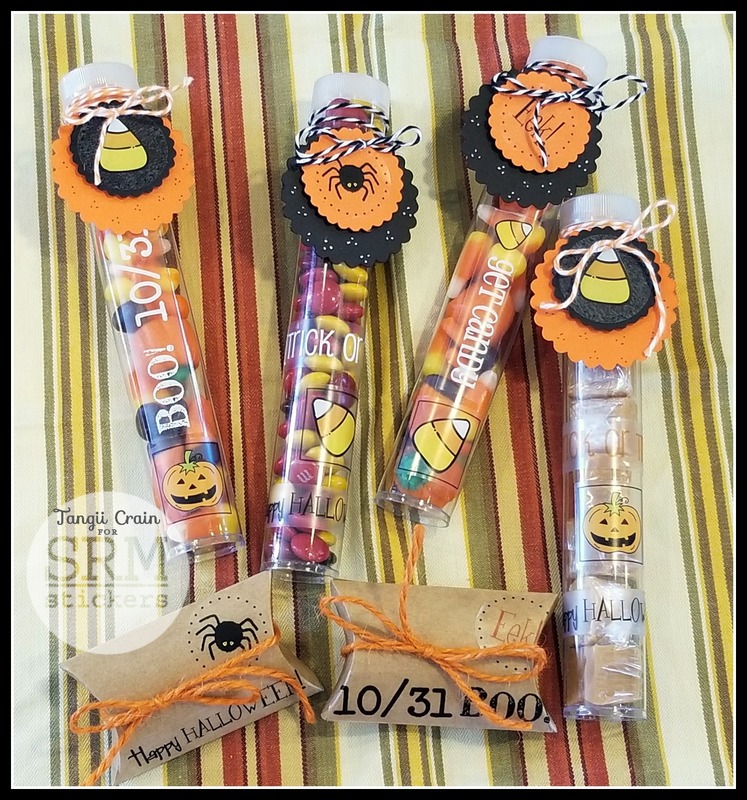 And I'm not saying that because this post is for SRM! Ok, that's it for me, thanks for popping in! 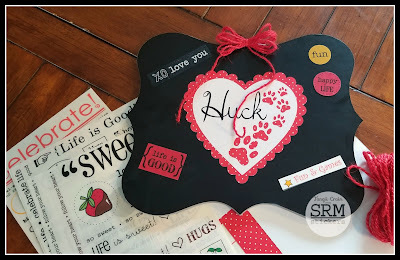 For these projects I used We've Got Your Stickers - Sweet, Sentiment - Life Is Good, Express Yourself - Birthday, Red Polka Dot Vinyl, White Vinyl, Black Vinyl. Happy Release Day!! Today the Krafty Girls & Guests are showing off all of the sets in this month's release! And they are ALL live now in the Krafty Store!! For today's card I inked up the supah cute Reindeer Games. I started this card when I was in Ontario visiting Kim, thanks to Alexis for letting me borrow that super fun "slope die" set!!! I may NEED it! 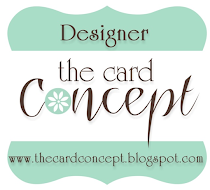 This was a really simple and easy card! Those dies, the stitched slope, banner (Tag Me dies from Reverse Confetti) and the Holly Berry (North Pole Wishes set by Reverse Confetti) made this whole card come together so quick... gave me more time to play with those cute reindeer! I stamped the Cabin scene in black and colored it in Copics, but those tree's are solid(ish) images, so I stamped them separately in green and then cut them out and popped them up. I also could have stamped the whole thing in green and colored it in (blending the green lines in to my copic coloring). Just look at how adorable they are!!! I think for my birthday instead of a pony, I want a reindeer!!! lol Well that's it for me, happy hopping and happy Shopping! Hey yall, I'm back with another fun post for SRM Stickers. 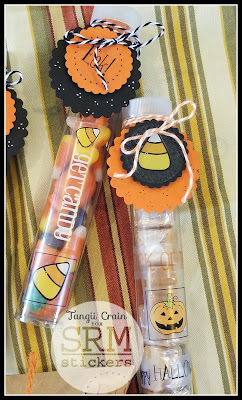 For today's post I put together some Halloween goodies for the neighborhood kiddo's. I started out playing with some Clear Tubes and then couldn't really stop myself, lol. and I added some small Kraft Pillow Boxes. 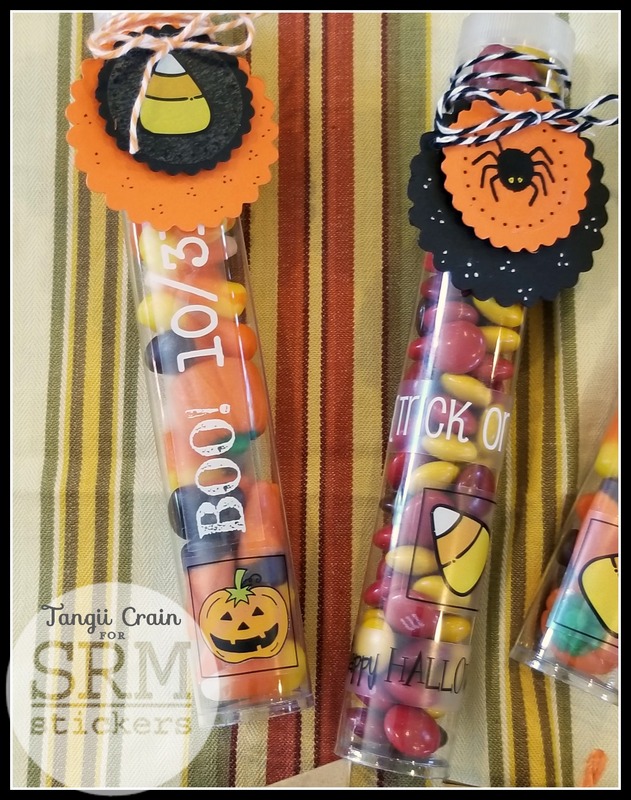 I grabbed some Fall candy from the store to fill up the Tubes (M&M's, Caramels & Candy Corn Assortment) and a couple of sticker sheets to decorate with. 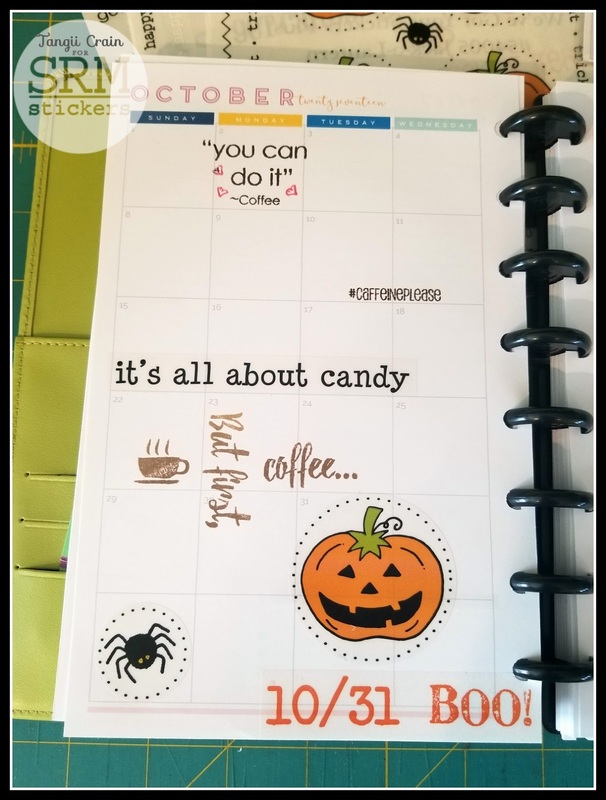 I chose to use Stickers By The Dozen: Halloween and We've Got Your Stickers: Treats. I just used 1 sheet of each, I was trying to keep this as an affordable idea, I figured I could make at least 10 more tubes with the 2 sheets I grabbed. I liked that the stickers had a clear background so the candies showed through. For those "tags" at the top, I grabbed some of these great Scalloped Circles (they come in 3 sizes), I chose a small layered on a medium. To fill in some of the space on the medium circle I used a Black & a White Gel Reminisce Pen to add some dots. 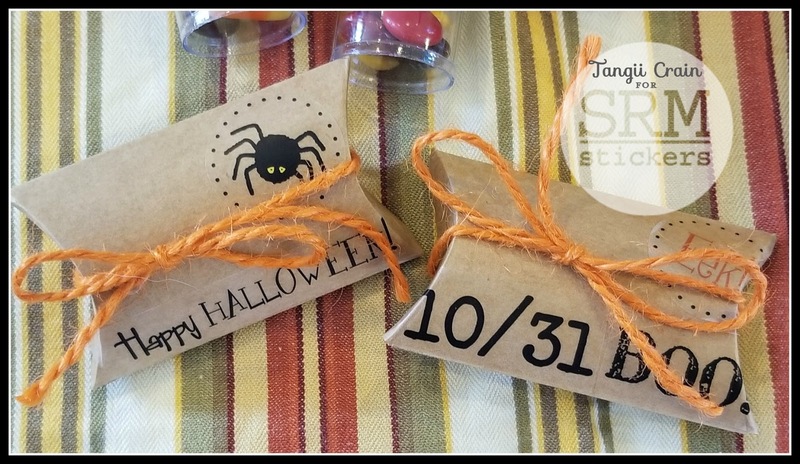 I wrapped some Black & Orange Twine around the tube a few times, then tied a bow through the tags. And finally, these adorable little Pillow Boxes! I LOVE that they come in Kraft (also available in clear)!! 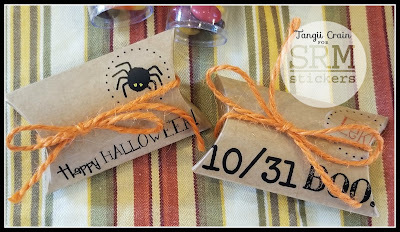 I added a few of the stickers from the same 2 sheets, closed them up and secured them with some great Orange Jute! I LOVE how easily these all came together (seriously, I worked on them while doing laundry!). 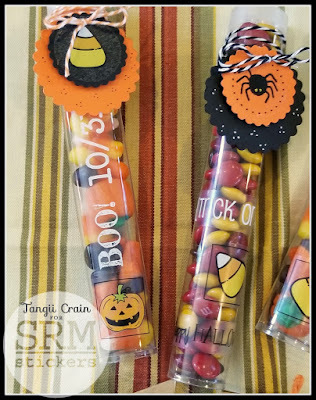 Between the "quick & easy" and the "easily affordable", I will be making these for all of our Trick-or-Treaters! 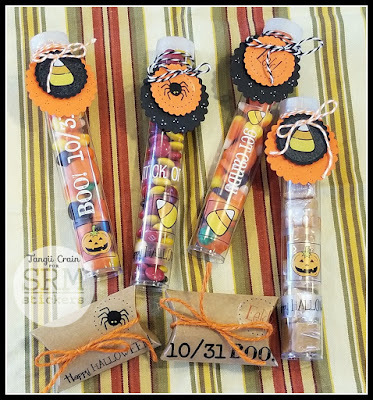 For these projects I used Clear Tubes, Pillow Boxes, Stickers By The Dozen: Halloween, We've Got Your Stickers: Treats, Scalloped Circles, Black & a White Gel Reminisce Pen, Black & Orange Twine and Orange Jute.